An ebola survivor carries a four-day-old baby suspected of having the disease into an MSF-supported Ebola Treatment Centre (ETC) in Butembo. 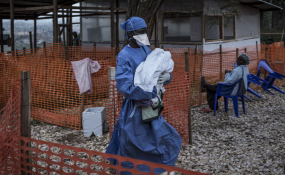 Dakar — Dozens of Congolese Ebola survivors are dispelling rumours and caring for patients and lone children in the world's second deadliest outbreak, health workers said on Thursday. The virus is spreading fast in eastern Democratic Republic of Congo, with 713 confirmed and probable cases and 439 deaths. It is surpassed only by the 2014 to 2016 outbreak in Guinea, Liberia and Sierra Leone, in which more than 11,000 people died. Nearly 250 patients in Congo have recovered since the outbreak began in July. Research has shown the disease gives survivors immunity. "I like this work very much," said Lydie Besolo, an 18-year-old in the town of Beni who survived Ebola and now spends her afternoons after school working as a nurse in a health centre run by medical charity Medecins Sans Frontieres (MSF). "I tell (the patients) my story. It helps them," she said, adding that she hopes to be a doctor someday. Health workers say one of the biggest challenges in this outbreak has been dispelling rumours about the disease. Suspicious of foreign intervention and political plots, locals have attacked volunteers and refused vaccines. Ebola struck during a politically tense period in Congo, ahead of December's election to end President Joseph Kabila's 17-year rule. The electoral commission at the last minute cancelled voting in Beni and other Ebola-stricken areas, which are opposition strongholds. "I tell them that it's not politics, it's a real disease," said Modeste Kasereka Kikopo, 26, a survivor who works in the MSF centre as an electrician and helps spread awareness. The charity said that about 20 survivors work in its centre in Beni, mostly looking after patients. Twelve survivors work in a nursery for children who have been separated from their parents, said the United Nations children's agency (UNICEF), while up to 40 survivors are part of community engagement efforts run by the Red Cross. "Ebola survivors are a critical entry point to build trust in the community," said Jamie LeSueur, head of operations for the Ebola response for the International Federation of Red Cross and Red Crescent Societies (IFRC). "Having someone go through this horrible experience and come out alive shows people that they can survive the disease and that we are there to support communities, not harm them," he told the Thomson Reuters Foundation.